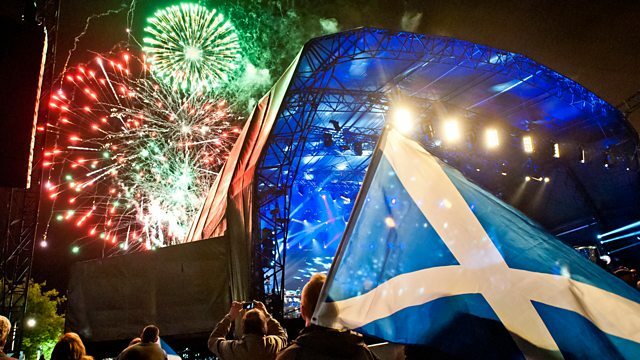 Jamie MacDougall presents live coverage from the 2015 Proms in the Park at Glasgow Green. Including performances from Alexandra Burke, Amy Dickson and Big Big Sing Choir. Live from Glasgow Green, Jamie MacDougall presents Proms in the Park celebrating the Last Night of the Proms with world-class musical entertainment. The BBC Scottish Symphony Orchestra, conducted by Stephen Bell, is joined by a host of musical talent including platinum-selling artist Alexandra Burke, acclaimed saxophonist Amy Dickson and Big Big Sing Choir, as well as a specially created piece of music by Oscar-winning composer Anne Dudley, based on her score for the BBC One series Poldark. There is also a round-up of some of the best acts performing at Proms in the Park events all round the UK. Orchestra: BBC Scottish Symphony Orchestra. Conductor: Stephen Bell. Performer: Alexandra Burke. Orchestra: BBC Scottish Symphony Orchestra. Conductor: Stephen Bell. Choir: Big Big Sing Choir. Whats It All About, Alfie? Performer: Amy Dickson. Composer: Hal David. Orchestra: BBC Scottish Symphony Orchestra. Conductor: Stephen Bell. Performer: Alexandra Burke. Composer: Linda Thompson. Orchestra: BBC Scottish Symphony Orchestra. Conductor: Stephen Bell. Performer: Jamie MacDougall. Choir: Big Big Sing Choir. Composer: Michael Korb. Orchestra: BBC Concert Orchestra. Performer: Russell Watson. Composer: Herbert Kretzmer. Orchestra: BBC Symphony Orchestra. Conductor: Marin Alsop. Performer: Jonas Kaufmann.